Eine gute Gelegenheit, Lumiere besser kennenzulernen! 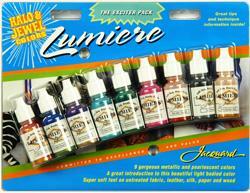 Nine gorgeous Lumiere metallic & pearlescent colors. These stunning, light bodied paints produce a super soft feel on many materials such as: fabric, leather, silk, paper, wood, etc.